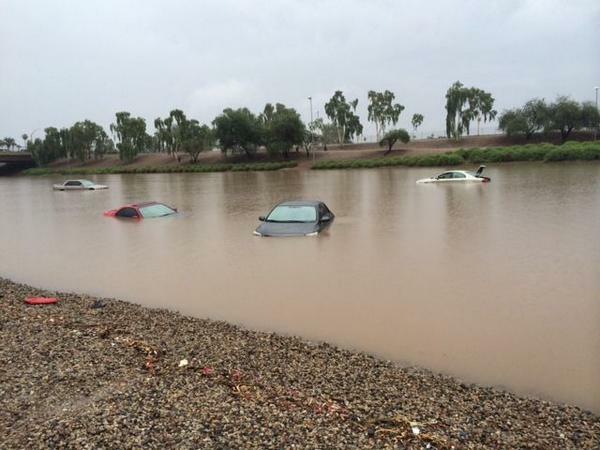 A flooded highway in Phoenix on September 8, 2014. 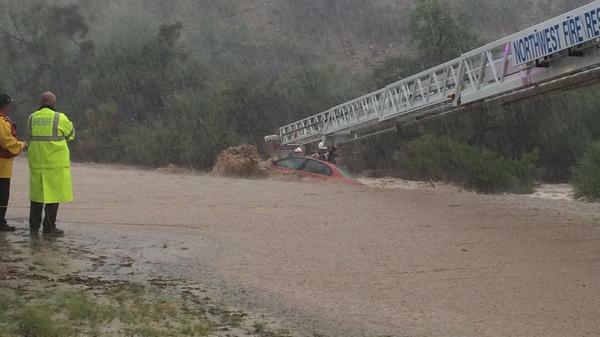 Update: 1:15 pm ET: Flooding is also being reported in other parts of Arizona, including Tucson and Scottsdale, as thunderstorms continue to drench the state. The remnants of Hurricane Norbert, plus moisture from the summer monsoon season, has led to an extraordinarily rare and debilitating Monday morning in Phoenix. So far today, 3.29 inches of rain has fallen in the desert city, which makes it the wettest calendar day on record there. This smashed the previous record of 2.91 inches, which was set in 1931. In addition, this deluge has dumped more rain in several hours than Phoenix typically picks up in an entire monsoon season during the months of July, August and September, according to a tweet from the National Weather Service. The heavy rains have been associated with a large group of thunderstorms known as a "mesoscale convective system," which is meteorologist-speak for an organized area of towering thunderstorms, each of which is dumping extremely heavy rainfall. Such storm systems are able to maintain themselves for hours, traveling across hundreds of miles in some cases. The rainfall has paralyzed parts of the city by putting major roadways underwater and flooding homes and businesses. A state of emergency is in effect in the city of Phoenix. There were news reports of more than two dozen cars submerged on Interstate 10, and portions of Interstate 17 and U.S. 60, among other highways, were also flooded. Many schools are closed, and several thousand customers were without power across the city. 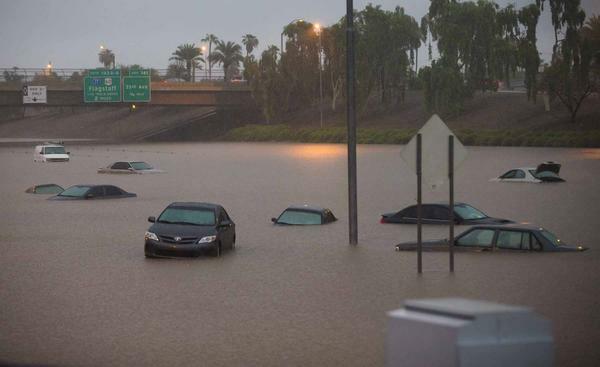 The flooding is resulting from a combinations of heavy rains falling on steep slopes that cannot readily absorb water, as well as downpours that are impacting the concrete jungle within Phoenix. Unlike cities in the South and the Northeast, where heavy rains are a more frequent occurrence, Phoenix's infrastructure was not built to handle rains of this magnitude. Flash flood watches and warnings are in effect for parts of California, Arizona, Colorado, Nevada and Utah as the threat for more heavy rain continues. Trend in extreme rainfall events. 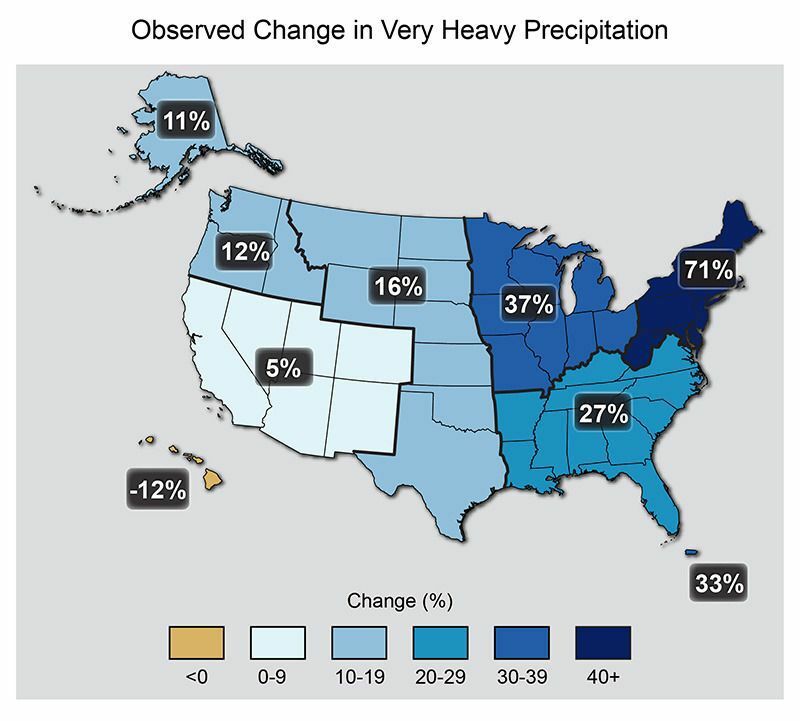 An increase in heavy precipitation events is one of the more robust findings of how global warming is already affecting the U.S. and other countries.